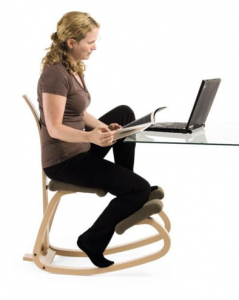 Home Ergonomic Benefits Kneeling Chair vs Yoga Ball – Which Ergonomic Solution is Right for You? Kneeling Chair vs Yoga Ball – Which Ergonomic Solution is Right for You? Nowadays people are very cautious about their health. Considerable attention has been given to the health risks associated with sitting at desk all day long. For that reason, many people have decided to do away with ordinary office chairs. The knee stool and the yoga ball are two effective options that have been popularly adapted. This article will help you decide which of the two options suits you best. One of the major reasons for the creation of the kneeling chair was to reduce pressure that is experienced by an individual’s back while sitting. This stool helps to bring the spinal cord into line. They were originally first introduced in the 1970’s in Europe; however, they have just gained popularity recently. Using kneeling chairs to maintain proper posture isn’t just about protecting the back from hunching, but also preventing serious damage to the spinal code caused by pressure. Below are some of the benefits of knee chairs. Kneeling chairs help to reduce the pressure exerted on the spinal code’s vertebral discs by distributing weight. With this sitting configuration, your body weight doesn’t all fall on the vertebral column, but it is instead shared by your shins and knees. 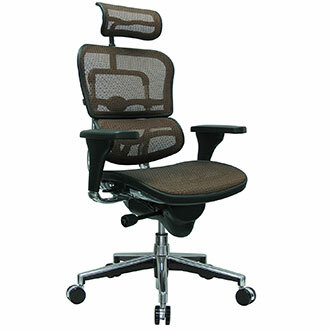 Due to the ergonomic design of knee stools, your posture quality starts to improve. It’s easy to detect any slump or changes in your posture while seated because it simply becomes hard to balance unless your sat upright. In brief, these chairs don’t allow any hunching or slumping. Neck and back pain are considerably reduced. The posture maintained by utilizing this stool is similar to that of standing and it’s the major reason to why back pain-related complaints are reduced. Relief from coccyx and tail-bone pain. This kind of pain is caused by staying seated for many hours with improper padding. Summary: Ideal for those looking to reduce back pain while improving posture. 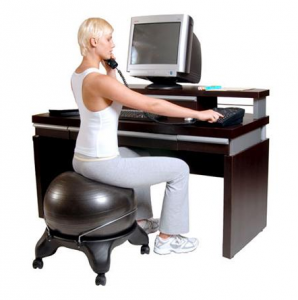 The yoga ball chair is sometimes referred to as a stability ball, exercise ball or Swiss ball. It’s made of soft and elastic PVC which is inflated with air. Its diameter varies from 14-34 inches. They are most commonly used for fitness, athletic training and physical therapy. Ten years ago, the idea of replacing an office chair with a yoga ball might have sounded quite odd, but in recent years, they have become extremely popular. Replacing conventional seating with these balls has a number of benefits. Some of these are as noted below. Helps to align the spine properly: Due to the ball’s unstable surface, the user has to constantly adjust his/her seating position. This automatically helps him or her to maintain a proper body posture. Furthermore, this also helps to improve the health of the spine. Improves the way muscles react towards instability: A person’s sense of balance when sitting on a yoga ball gets better as time goes on. Yoga balls encourage plenty of movement: Maintaining the same seating position for an extended period of time can adversely affect the abdominal as well as back muscles. As a result, it is always advisable to change seating positions as frequent as possible. Yoga balls help to improve blood circulation: This is due to the fact that they encourage constant movement of the body. Exercises the abdominal muscles: The abdominal muscles are responsible for countering the changes in the balance of an individual’s body. Therefore, spending sometime on the ball acts as abdominal exercise. Summary: Great for improving posture through core strengthening. Combines fitness with office work.